Happy Earth Day! FREE e-book. 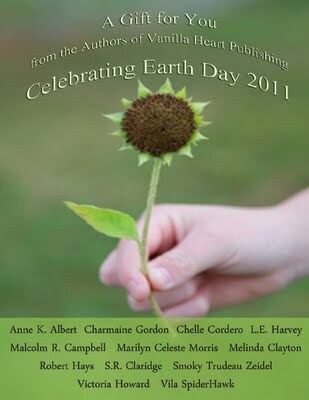 In celebration of Earth Day 2011, Vanilla Heart Publishing authors ~ Anne K. Albert, Charmaine Gordon, Chelle Cordero, L.E. Harvey, Malcolm R. Campbell, Marilyn Celeste Morris, Melinda Clayton, Robert Hays, S.R. Claridge, Smoky Trudeau Zeidel, Victoria Howard, and Vila SpiderHawk ~ share short stories, recipes, puzzles, crafts, poetry and more in this free anthology celebrating nature.